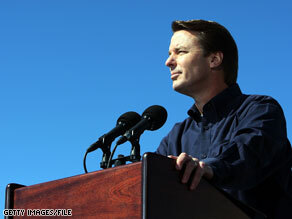 Former Sen. John Edwards' spokeswoman flatly denied a story in the National Enquirer Wednesday. Washington (CNN) - Former Sen. John Edwards' spokeswoman flatly denied a story in the National Enquirer Wednesday that claimed the 2004 Democratic vice presidential nominee is engaged to his mistress, Rielle Hunter. "John has said that when his divorce is final, he'll buy her a diamond ring," the Enquirer quotes a 'close source' in the story as saying about the marriage proposal. "But in the meantime, he's getting them a house." But Joyce Fitzpatrick, an Edwards spokeswoman, said in an e-mail to CNN that the report was "absolutely untrue." The Enquirer broke the story of Edwards' affair with Hunter as well as his being the father of Frances Quinn. A federal grand jury is investigating payments the former senator's campaign and supporters made to Hunter, who worked as a videographer for Edwards as he prepared for his 2008 presidential campaign. Andrew Young, a former Edwards' aide complicit in helping the former senator hide the affair, revealed in his new tell-all book "The Politician" that prosecutors peppered him with a number of questions regarding the payments made to Hunter. "I sat in the witness chair, and as the men and women of the grand jury scrutinized me, the prosecutors pressed me for exact information about checks that were written, the way the money was used and the timing of events," Young wrote. "They wanted names, dates, and amounts in very specific terms." I used to like John Edwards, but now I view him as nothing but a disgusting pig. He & Rielle Hunter are both scum and deserve each other. I just feel bad for Elizabeth and their children. Seriously, I was a supporter of Edwards for President and, at this point, I wouldn't believe him if he told me that water is wet! I'd need a second opinion on it. Time to close the door on this unhappy situation and just pray for everyone involved, especially that beautiful child. Who cares about John Edwards. Enough with this guy!! He's unelectable and is finished!! The country has other pressing problems to deal with than to focus on Mr. Edwards. Forget him!! What a credible guy. Yeah, sure, we believe ya John. Scumbag and lowlife that about sums him up. If it were the National Inquirer reporting it, I would believe them! Yes, and the Edwards' camp has SUCH credibility when it comes to denials. They might as well not speak .. how could anyone believe anything they say about anything? The National Inquirer has WAY more credibility than they do .. and the sale of beachfront property in Southern California shouldn't be too hard to check out. We'll know the truth soon enough, more's the pity .. If Edwards is denying it, you can bet your house it's true.